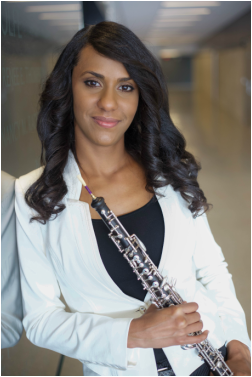 Nermis Mieses is the Assistant Professor of Oboe at Bowling Green State University in Ohio, Principal Oboe of the Michigan Opera Theatre in Detroit, and Chair of the Gillet-Fox International Competition for Oboe. Her distinctions include being the first American to place as finalist in the prestigious Barbirolli International Oboe Competition held in 2014; first place at the 2011 First International Oboe Competition in Santa Catarina, Brazil, and Best Interpretation of Brazilian Music Prize; and second place at the 2012 Society for Musical Arts Young Artist Competition in Ann Arbor, MI. She has appeared in solo performances at the Kennedy Center for the Performing Arts, the Cranbrook Music Guild Series in Bloomfield Hills, MI, has soloed with the Puerto Rico Symphony Orchestra, Michigan Philharmonic Orchestra, BGSU Philharmonia, BGSU Wind Symphony, and toured Denmark as soloist and chamber music performer with the Thy Chamber Music Festival (2011, 2013). She has presented multiple masterclasses and recitals in Florida, Iowa, Texas, Michigan, Nebraska, Indiana, Ohio, New York, Georgia and Wisconsin. Formerly principal of the Michigan Philharmonic, she has also performed with the Ann Arbor, Sphinx, ProMusica Chamber, Rochester, Lexington, and Puerto Rico Symphony as well as the National Repertory Orchestra, Sewanee Music Festival, Idyllwild Arts and FOSJA. She held previous teaching positions at the University of Kentucky, Ohio Northern University and Hillsdale College. She holds D.M.A. and M.M. degrees from the University of Michigan under Dr. Nancy Ambrose King.